Shipwreck Island is suitable for survival gameplay and role plays. A cruise ship is stranded on a deserted island. There’s a small house on the island which works great as a shelter for the first night on the island. But to survive you will really have to start scavenging the ship or look in your surroundings for ways to survive. The Islands of Khanta features several large islands situated somewhere far out in the ocean. On each island you will find a different biome and this makes it a quite interesting and enjoyable map to explore. For example, the main island in the center includes a normal plains biome with some rocky mountains and another island features a huge mountain of lava. This is a custom made world which features 5 completely different islands with different biomes like desert, mesa, mushroom, plains, and an exotic biome. The world includes a large mountain and custom trees. 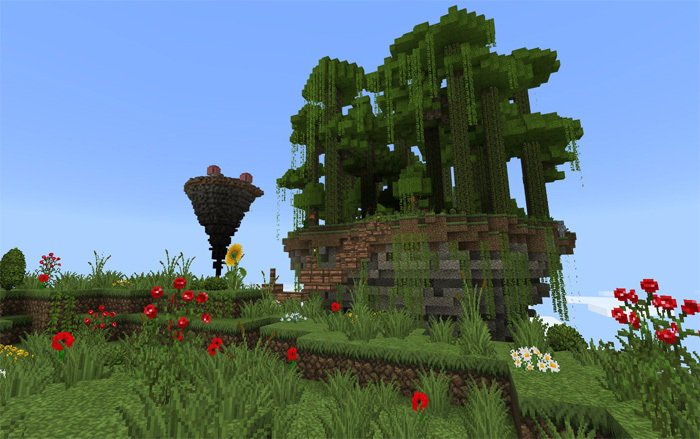 It’s mainly that which makes it stand out compared to an ordinary seed world in Minecraft. Also, the diamonds, emeralds and gold spawn rate has been increased from 5% to 10% so you can find them more easy. It’s a really cool world to explore! The world is infinite but if you travel far into the ocean, you will find cut off chunks so beware of that. TheRedstoneCrafter taught me how to import PC worlds to PE. Huge Thanks to him! This is a huge custom terrain suitable for survival gameplay or other types of adventures. It includes several different biomes with custom trees, mountains and more. There’s a huge cavern somewhere under spawn so be careful when you start digging. If you are playing the map on a low-end device then make sure to turn down the render distance. Important: You may use this world for your own creations as long as you give credits to the original creator (Tyler707 Proarcher). This map features 21 small islands scattered around the ocean in an infinite world. You can either use the map as a survival world (and yes you can earn achievements) or you can use it to build an adventure of some kind. The edges of the ocean doesn’t connect perfect with the rest of the terrain, but that’s a minor problem which could be resolved with some in-game terraforming. Survive as long as you can by exploring the islands and gathering their different resources. Some of the islands included are winter islands, a Nether Island and The End island. The map was created with WorldPainter and then ported to Pocket Edition using MCCToolChest PE. Start out on a small planet (based on the Overworld in Minecraft) and use the resources you find to explore the rest of the galaxy and its planets. There are tons of different planets and each one look very different from the other. For example, one planet is made out of just slime blocks and another is a miniature of The End. The main objective is to find a way to survive for as long as possible, and if you get the chance then also explore the rest of the planets in the galaxy. The spawn is on a planet most likely based on Earth of the Overworld. There you will find a chest with a few items to get you started. As much exciting it is exploring other planets it’s also dangerous since you don’t know what these planets might hide inside. The map took roughly three weeks to complete! This is a custom terrain which has been built to be used as a survival world. You’ll spawn on a medium sized island and surrounding the main island are a couple of other small islands. There are no structures on the islands so you will need to build everything from scratch. There are no set objectives or quests so you will have to make them up as you go. It’s a really nice terrain which was most likely built using WorldPainter and then ported to the bedrock version of Minecraft. I might actually make a tutorial for it later at some point. One downside is that it isn’t built in an infinite world. It could have been done though if it was ported a bit differently though, so maybe that will happen in an update. This is a survival build based around a jungle temple which includes an extensive network of treetop platforms and walkways. There are lots of things to see here. For example, in one area there is a Nether Portal which will take you to the Nether not far from a Nether Fortress. There is also a Nether Wart Farm located inside one of the buildings. Basically everything (including resources such as food and weapons) are included which you’ll need for going out and explore! This is a survival map taking place far up in the sky on multiple different floating islands. The main objective is to find a way to visit and explore all of them. But it’s not going to be easy. First off you need to build the bridges and then there are also monsters on the different islands who can be quite dangerous. How long will you be able to survive? You’ll start out in a lobby. All signs are in French, but don’t worry, it’s not too much of an issue. Just press the button to teleport to the islands and then start playing. You can expect somewhere around 4 to 8 hours worth of gameplay. The map is best suited for max 5 players. 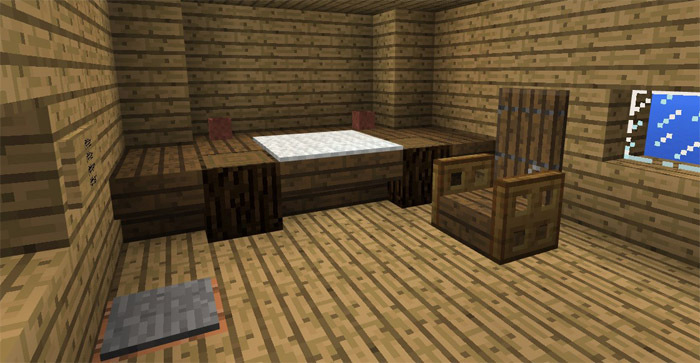 This is a survival map mixed with an adventure which starts off on a ship at sea. You’ve been sent by your king to go out on the ocean and discover a legendary island. Alone and tired you finally go to bed but you don’t get much sleep before you’re woken up by an awful noise. A few moments later your ship is wrecked and you find yourself stranded on a tropical island. Christopher is a young explorer who was recruited by the King to discover a legendary island. Nobody really knows where it is except that it’s somewhere in the middle of the ocean. On 23 March, 1882, Christopher went to sea.